Altamira Fine Art Jackson is pleased to welcome Brad Overton for his first solo exhibition at the gallery, Reprise, opening August 1, 2017. Please join us for the Artist Reception, Thursday, August 3rd from 5:30-7:30pm. Brad Overton is a Salt Lake City, UT based artist with a prolific career, exhibiting for nearly two decades multiple bodies of artwork. Overton likes to play the role of the trickster in art and life. The trickster or jokester is an energy he cultivates – intentionally balancing the typical sobriety of art with a touch (or wallop) of humor. “Once you have established technically proficiency and an aesthetic in your artwork its time to play. The philosophy I am enjoying right now is in finding the humor…because without humor you are just suffering,” Overton says. With Overton’s Vintage Toy series we get a sampling of his humor – all titles are taken directly from iconic rock song names i.e. : ‘Gimme Shelter’ or ‘Janie’s Got a Gun’ or ‘Against the Wind.’ With technically masterful attention to detail, Overton renders a naturalistic depiction of his subjects. The vintage toys are made of lead – chipped, petite but solid, and jewel-like; originally manufactured, molded and painted on an assembly line by hand by factory workers. With misaligned paint-jobs and unignorable casting mold seams, these bought again/sold again, forgotten objects reemerge under Overton’s eye with the child-like levity and metaphysicality intended from the bygone curio. The objects themselves have amazing character with form and gesture resembling figures from a Botticelli painting – and to paint a still-life of an already strangely painted mass-produced and forgotten object as a large monument allows Overton to invite his art-lovers to play again. 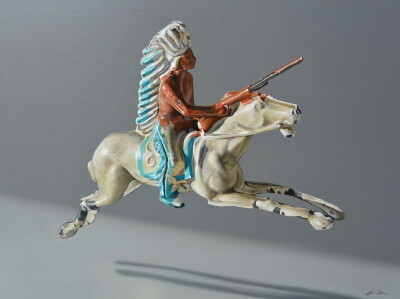 The toy figurines range from downhill skiers to cowboys and Indians. “Many artists edit Western history to icons instead of our real dark history - creating a fantasy based on reality. But it is good to be mindful of our very real history when ‘playing cowboys and Indians” instead of our romanticized Americana leanings,” says Overton. 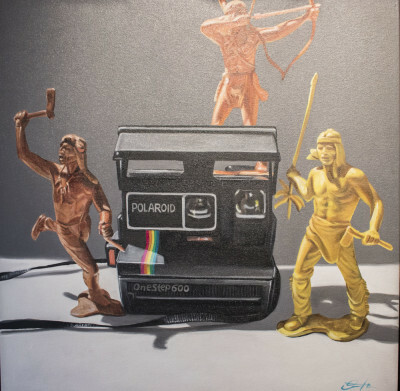 Overton’s ironic take on his subjects can both conjure a magical connection with our youth while complicating our contemporary relationship with our present history. 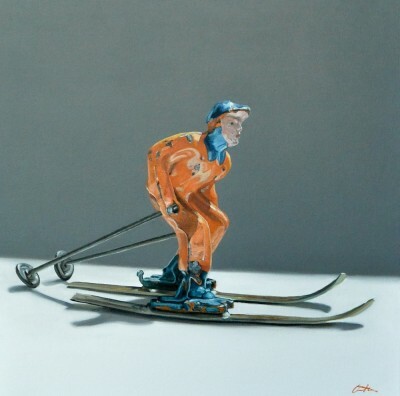 Brad Overton has exhibited in galleries and museums across the US and is included in many private, corporate and public institutions and collections. Overton has an upcoming solo retrospective at the Marietta Cobb Museum of Fine art in Georgia, Sept 23 - November 18, 2017. Recent exhibitions include the Arcadia Gallery in Los Angeles, Blue Rain Gallery in Santa Fe, Julie Nester Gallery in Park City, Marshall Gallery in Scottsdale, Phillips Gallery in Salt Lake City and Coda Gallery in New York City. He has shown in the Springville Museum of Fine Art, University of Utah Museum of Art, as well as included in the Corporate collection of the Paris Hotel in Las Vegas and collections of the University of Utah Art Department. Recent feature article – “The Philosopher’s Palette” was included in Western Art and Architecture.